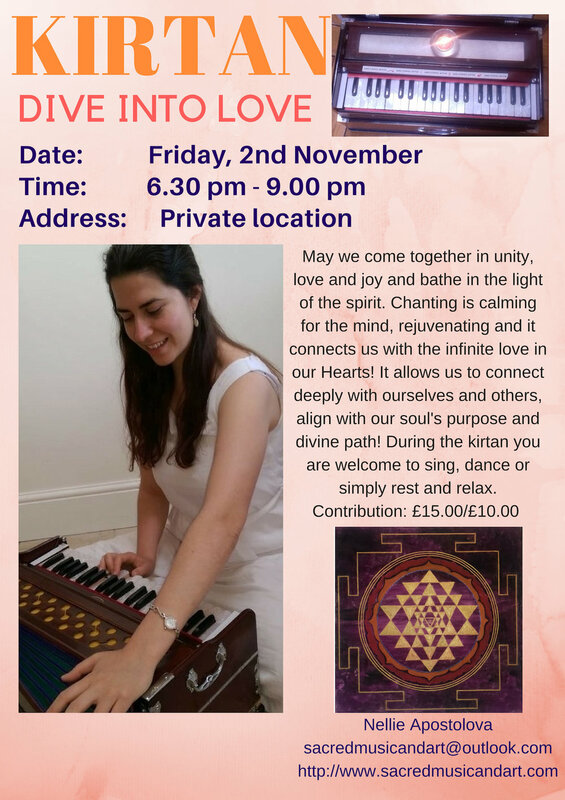 I would like to invite you to a kirtan where we can gather, celebrate, rejuvenate and connect with each other! Chanting allows us to connect deeply with our Divine self and feel grounded, balanced and rejuvenated. Kirtan is a type of singing which allows us to connect deeper with ourselves and others. It is the repetition of sacred sound which cleanses and rejuvenates our mind, body and spirit. It does not require any previous practise or special training as it is simple and easy to follow. The repetition of sacred sound releases stress and toxins from the body, improves our vitality and opens the cells in our body to breathe deeper and receive more nourishment. It allows us to release trauma stored in the cellular memory as well as cleanses the mind of limiting beliefs and conditioning. Chanting also allows us to connect with our intuition, regain a clarity of vision, feel grounded, balanced and rejuvenated. Kirtan also helps with insomnia, allows us relax and connect with our creativity, intuition and a deeper vision for ourselves and our lives. Who can attend a kirtan? You! It is for everybody inclusive of any other spiritual practice or previous experience! We are a community of beings who gather regularly to connect deeper with ourselves and others. We are all valued, respected and welcome to the events. You can follow the kirtan and repeat the words of the songs or you can simply relax into the music and experience the healing benefits. Do I have to sit down or follow any physical postures? You do not have to follow any special physical postures, you are welcome to sit down on the floor or a chair, to lie down, to dance and express yourself through movement. This is a safe space, where you are welcome to relax, move as it feels natural to you or to practise your favourite yoga postures.